UPDATE May 16 2016: Small correction to burled wood version: the strings plane mesh should have had a plain background texture like the other versions, not the burled wood texture! If you can see the flaw in game, please re-download and overwrite the older package file with the new one dated 5-16-2016. Following my Medieval/Renaissance-Style Piano, here's another historical-looking musical instrument for medieval or fantasy sims. 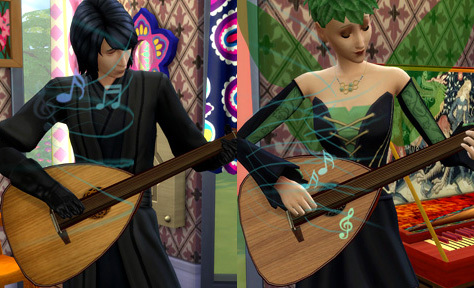 This lute costs 600 simoleons and is found in the Activities section in Buy Mode, where the guitars are found. It comes in three recolours, as below. 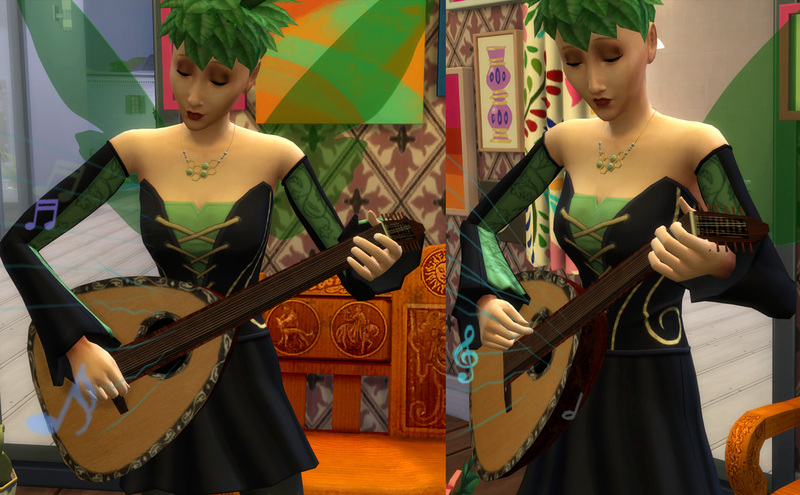 Not quite an 100% authentic lute due to having to line up with the default hand positions for playing a guitar, it has a guitar-length neck rather than the short neck a real lute would have, and so is more like a lute guitar. 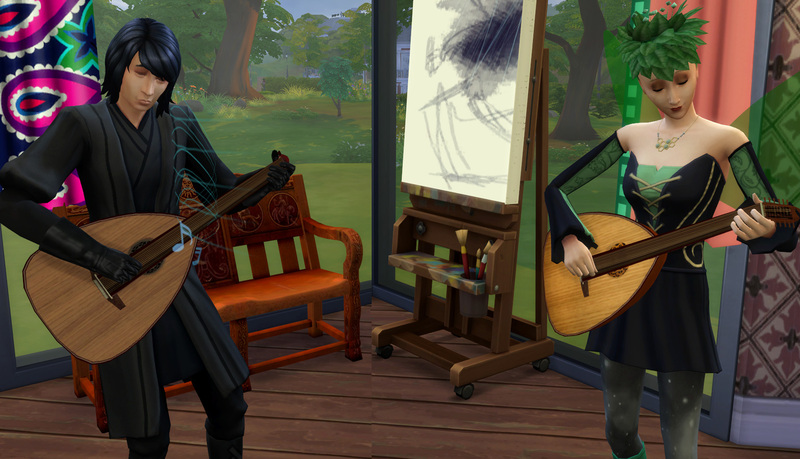 I have a lute guitar in real life and this is based a little on mine, with the first recolour being a little like my IRL one. The other two are 1) another standard traditional variation and 2) a non-standard fancy version with ornate body trim I adapted from a mandolin, and a burled wood back. One minor issue: because of the addition of 12 pegs instead of the usual 6 pegs a guitar would have, there will occasionally be some clippage of fingers into the bottom peg or two (see right photo below). This is not really noticeable in normal gameplay. It has geostates, so it has a stand which the lute sits on when not in use, and which disappears when the lute is picked up and played. 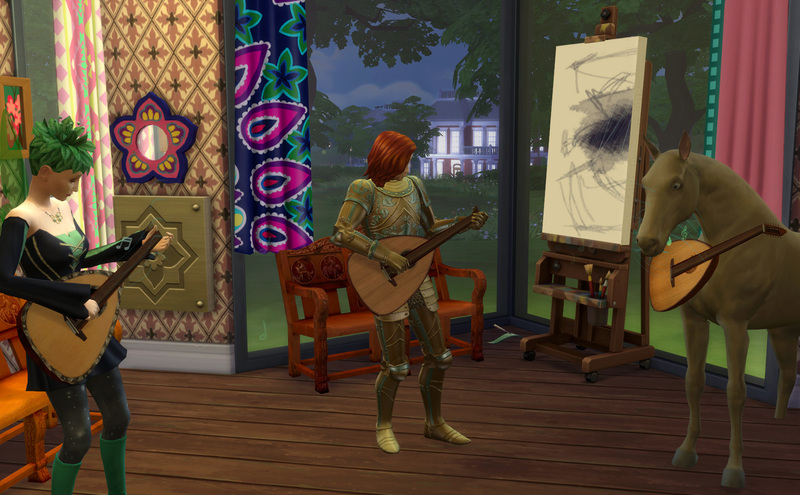 Thanks for looking, hope you'll find this useful for your non-modern simmies. Meshed by me in Milkshape, with a couple of modified EA items (neck and stand). 323 people have said thanks to Esmeralda for this download.